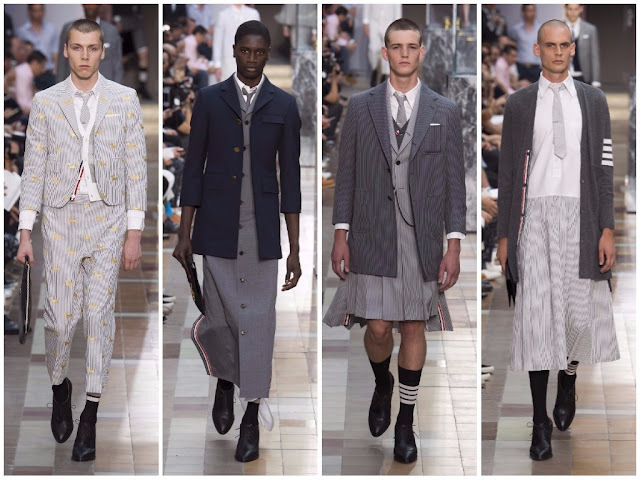 Gender normatives have never truly been Thom Browne’s thing. The American designer, presenting at Paris Fashion Week, is open about challenging gender conventions and it has been a lifelong journey. The shoes he wore as a child, formless moccasins, dipped in gold—a family tradition—were placed in vitrines on the catwalk at his recent Spring 2018 menswear show. The purpose was to highlight and propose possibility to the Thom Browne customer, to encourage them to rebut gender stereotypes with a widely diverse selection of gender ambiguous clothing. 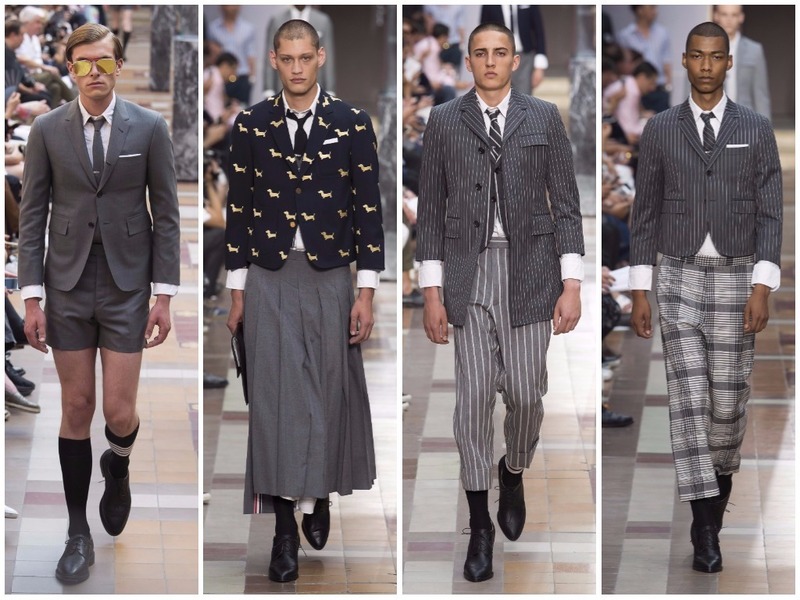 Bolton and Koda declared men in skirts as “the future of menswear” in 2003 and their answer may be in the form of Browne. He simply is “the future of menswear”: he presents us with challenging viewing material, a lot is to be said for that in the Instagram-obsessed, ephemeral delight-inclined culture we are established in, and he is an unorthodoxly independent thinking. His messaging will filter down to others’ collections as the next few seasons come to pass, surely. The clothes proved Browne’s self-referential streak—they took inspiration from his womenswear shows and were adapted in male proportions. The show’s progression developed from womenswear-tinged menswear to fully-fledged womenswear-inspired menswear and concluded in classically comic Browne fashion. Bride-groom, he was called. Facing the audience first was a sharply-tailored tuxedo but trailing was a decorative gown. Who do you want to be today? Your decision awaits. I could wax rhapsodical about Browne’s affinity for fashion theatre but one simply must look at his aversion to present pleasingly placid menswear in a season preoccupied with the urban jungle and fusing casual-wear with workwear—a dissection of gender with wry lucidity, an element of fantasy and fascinatingly perverse suiting. The future of menswear is here.